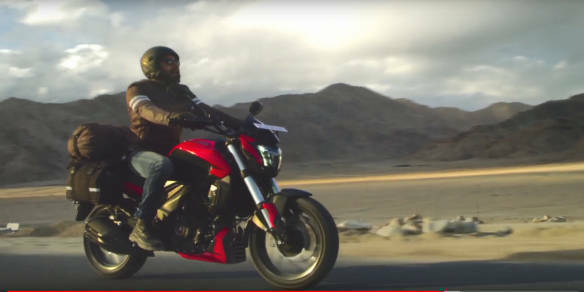 The 2019 Bajaj Dominar was revealed by Bajaj Auto, via a new advertisement to announce its new, World's favourite Indian, global brand identity campaign. The video showcases the new Dominar sans camouflage, revealing the updates that the bike has received. The most obvious change is to the front end, and as spy pictures confirmed early last year, the 2019 Dominar gets new USD front forks. These look identical to the unit on the KTM 390 Duke and appears to be of similar dimensions. Another indicator of the suspension unit being identical to the KTM is the placement of the front brake disc. Given the touring intent of the Dominar, expect Bajaj to alter the damping in accordance. The other apparent change is the exhaust system that now features twin-port exhaust canisters, suggesting a throatier exhaust note. While we do not have confirmation, Bajaj is expected to squeeze more power out of the 373.2cc, liquid-cooled, single cylinder engine that, in the current Dominar, produces 35PS and 35Nm. The new motor is expected to meet BSVI norms and one can't rule out the possibility of Bajaj incorporating a DOHC set up, like the KTM 390 Duke's motor. Bajaj has also ditched the gold alloy wheels and resorted to blacked out wheels with silver outlines on the spokes, lending it the effect of diamond cut alloy wheels that you see in cars. Other chances include a blacked out knee recess area, on the fuel tank that also serves as the mounting point for the secondary digital display. It has readouts for gear position, odometre, tripmetre and clock. The updates are expected to bump up the price of the Bajaj Dominar by Rs 10,000 to Rs 15,000. Bookings for the 2019 Dominar have commenced across all Bajaj dealerships in India.